Authorities have failed to protect FBiH cattle breeders so that they either use fraudulent means to obtain subsidies or they just quit agriculture. For 12 years, Mario Gilja has bred pigs at his family farm in the village of Jare. Bosnia and Herzegovina (BiH). Breeders like him are allowed a subsidy for every pig they sell to an authorized slaughterhouse and get a sales receipt for. Gilja can’t afford the subsidy. The authorized slaughterhouses, he found, paid so little for his animals he was better off selling them to other villagers. Without sales receipts, he could collect no subsidies. Gilja is not the only breeder to have faced this situation. 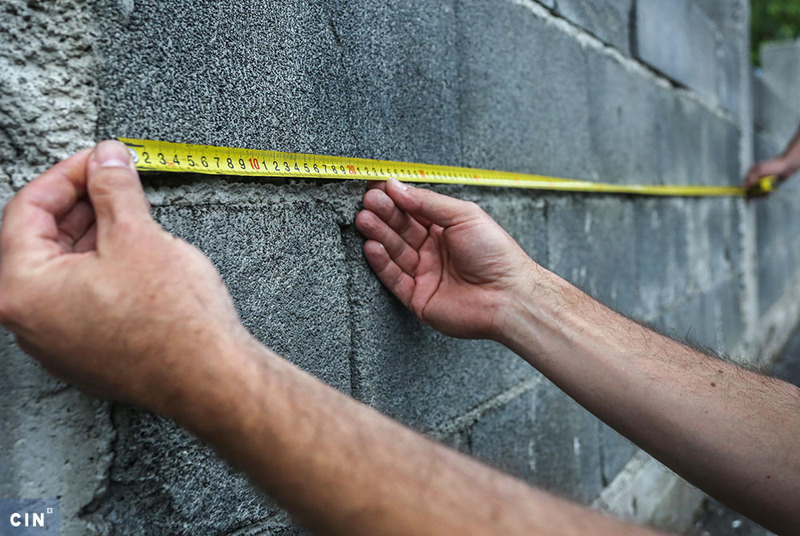 The Center for Investigative Reporting in Sarajevo (CIN) interviewed dozens of cattle and pig breeders in the Federation of BiH (FBiH) who said that slaughterhouse owners would knock down the price they were willing to pay for cattle if farmers asked for a receipt — which they were actually obliged to provide. Slaughterhouse owners can drive prices down because the FBiH authorities have not taken steps they could to protect breeders, such as, setting minimal purchase prices. The breeders must accept the blackmail because they need vouchers to claim subsidies. The goal of the subsidy, which is open to all farmers who have met certain requirements and registered for them, is to strengthen local food production and secure stable income and better living standards for local farmers. CIN found they often cause the opposite. Some farmers use fictitious receipts to claim state money. Many more just give up on breeding because, even with subsidies, it does not pay off. The relevant institutions do not keep good records about the state of federation farms, while the oversight of the subsidies is weak. In any case, the state is losing millions. 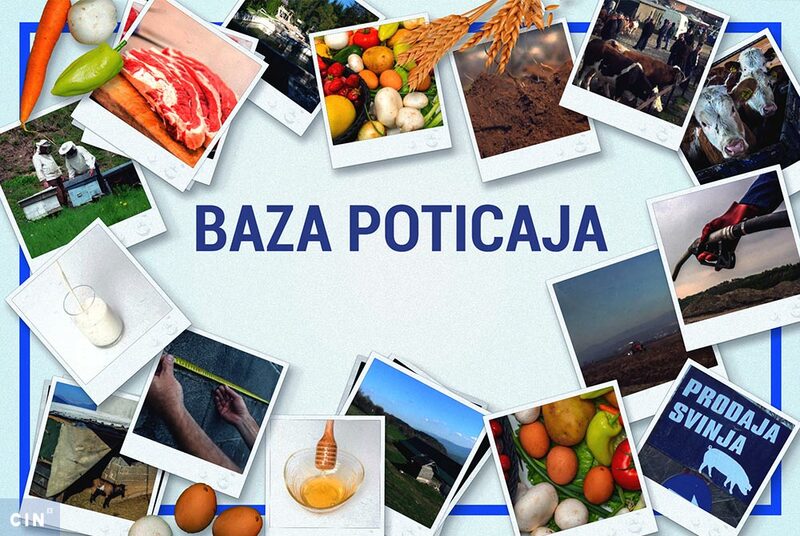 Every year, the FBiH Ministry of Agriculture, Water Management and Forestry signs off on around 14 million KM in subsidies to farmers for breeding and meat production. In 2012, Gilja received 4,200 KM, about 60 KM per each of 70 pigs he had bred. He sold the pigs to Rakitno Meat Industry which paid him around 2 KM per each kilogram of meat. “Now, would you give a 100 kg pig for 200 KM? A piglet costs me 100 KM. To fatten it up for sale it needs to eat concentrated food for 90 days. And then you sell it for 200 KM? Makes no sense,“ he said. 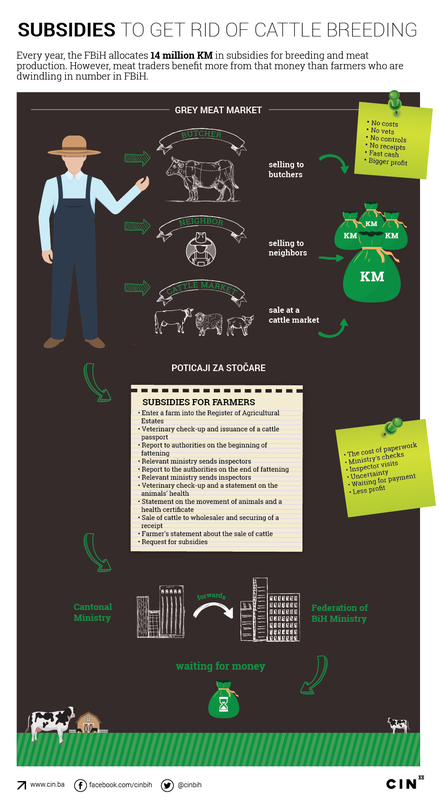 A slaughterhouse owner can dictate prices because the Ministry has not set down the minimal price of meat that would protect local producers in line with the FBiH Law on Agriculture. This was such a bad deal for Gilja that he began selling pigs to his neighbors, not to slaughterhouse. The chain of assisted breeding breaks here, because breeders cannot claim a subsidy without receipts showing that their animals landed in an authorized slaughterhouse. In addition to the sales receipts, famers who want to be declared eligible for subsidies need an animal identification card or passport and a record of the beginning and ending of fattening. CIN reporters found that all the required documents can easily be obtained illegally. An animal passport is a proof of an animal’s existence. It contains the unique number of an ear tag and information about its owner. The Agency for Animal Identification issues these through an authorized veterinary who must check and keep record of the animals. A CIN reporter needed just 30 KM and 30 minutes to obtain an animal passport at the Tojšići cattle market near Tuzla. “Here you are pal. Would you be a customer to buy a calf?” a trader asked the reporter. After the reporter explained that he was looking for an animal identity card, the trader said: “Sure, I have ‘em. Over here.” He took out three cattle identity cards from a compartment of his van. “I have three articles … Got one from 2014, here’s another one from 2011 and another one from 2009. They are all from Zvornik, but a veterinary can fix ’em… Thirty marks”. The deal was done. One of the documents necessary to obtain subsidies was secured – a passport for a head of cattle registered in October 2014 which does not exist anymore. This is possible because authorities don’t know how many heads of cattle are in the country. Ljubomir Kalaba, head of the Veterinary Office of Bosnia and Herzegovina, admits that the system for marking cattle is not working. The discrepancy is huge because farmers and vets have not been reporting the numbers of slaughtered and dead animals. Without an accurate database, it is difficult to check if a farmer has claimed a subsidy for a head of cattle that does not exist. 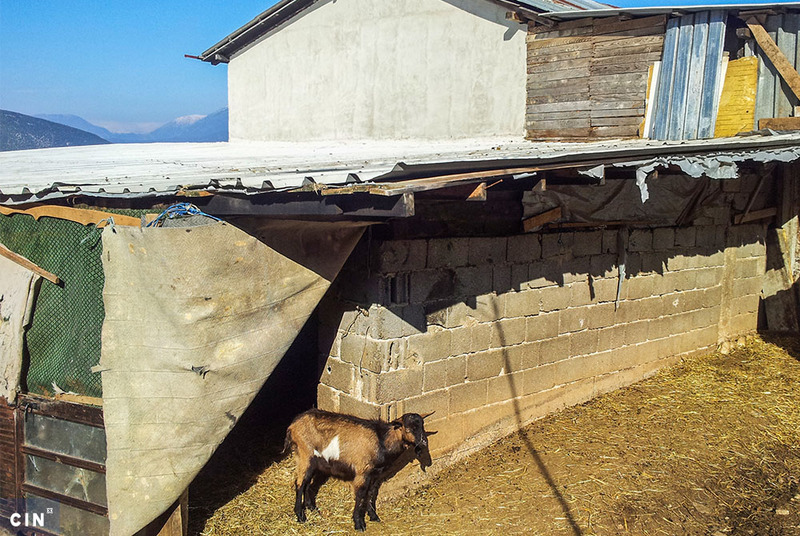 Officials from the BiH Veterinary Office say a census is needed of all farm animals in BiH. There’s no money in the budget for that. In 2012, the BiH Indirect Taxation Authority uncovered misuse of animal sales receipts. Inspectors found that traders were reporting far less trade in meat products than suggested by the number of heads of cattle for which ranchers claimed subsidies. Undeclared trade amounted to more than 36 million KM and based on this number tax inspector calculated the amount of unpaid taxes — more than 6 million KM. Inspectors found that most of the 55 wholesalers authorized to buy meat from local producers did not have records of cattle accounted for by receipts between 2009 and 2013. This could mean one of two things: either they bought cattle from ranchers but did not keep the record in order to avoid paying taxes, or they entered fake figures into receipt books for farmers to show while not buying cattle at all. In practice, both things have been happening. This tax office brought Gilja and the director of MI Rakitno, Damir Pavković, into court. Even though he claimed that he sold pigs to MI Rakitno, the carbon copies of Gilja’s receipt books were not found in the firm’s accounting department. The FBiH Department for Inspection Affairs demanded he returned 4,200 KM worth of subsidies. Gilja appealed to the Municipal Court in Široki Brijeg and the case was dismissed for lack of evidence. The court concluded that the FBiH Inspection Authority did not prove that a receipt book was fictitious, only that it had not been recorded in the buyer’s accounting department. Taxmen found that MI Rakitno evaded nearly 200,000 KM. Pavković told CIN that he has never bought pigs but he had no choice but to pay the tax. Fictitious trade was also uncovered in more than 40 other firms. A number of court cases resulted. Inspectors found that Salko Kamerić, owner of “Salko-Mex“ in Kalesija, evaded the most in taxes, more than 1.5 million KM. This July, before the Municipal Court in Tuzla, he pleaded guilty to falsifying and selling 721 receipts which earned him nearly 70,000 KM. He got a suspended sentence and was asked to pay back money he earned by selling receipts. Still, the state will find it hard to recover taxes because Kamerić closed the firm in November 2015. According to the FBiH Law on Liquidation, a firm can be liquidated only if it owes no debts to the state or other creditors. When CIN asked the tax officials how Kamerić had pulled this off, they said it was probably their error. In December 2013, tax officials established that “Salko-Mex” owed 1.5 million KM. After a number of appeals and decisions, the tax office issued an official statement which read that the firm was not a tax debtor. The firm was liquidated in November 2015 and erased from the court register in January 2016. Two months later, the court reached a ruling that confirmed the existence of debt. Tax administration officials say that they had not started a collection action against the firm because it had ceased to exist. Kamerić’s son Adnan and his firm “Dolar Company”, which supplies meat to public institutions and companies in Tuzla, took over the business. According to CIN’s database of public procurement, these two firms have supplied at least 1.4 million KM of meat to public institutions. Based on “Salko-Mex” receipt books, 680 cattle breeders acquired fake proof of sale totaling 3,845 heads of cattle. Between 2009 and 2013, ranchers received on average 360 KM in subsidies per a head of cattle. In Kamerić’s case, this works out to at least 1.3 million KM in subsidies. To date, 30 cattle breeders have been sentenced for fraud. All have been given suspended sentences and obliged to return a total of 73,600 KM. Among those sentenced are cattle breeders Mirsad Avdić and Esad Džafić, who breed cattle and trade in cows in Gračanica and Srebrenik. They said this was the only way for them to obtain receipt books from slaughterhouses. “Had they given it to us, then they would’ve had to record these cows. They did not want to. People worked in the shadow economy. The state let them do it,” said Avdić. Agricultural subsidies have been misused for years because there are few controls. Before approving subsidies, officials from the Cantonal ministries are supposed to visit a farm and take minutes of the beginning and the end of the fattening and write down the ID numbers of all cattle tags. 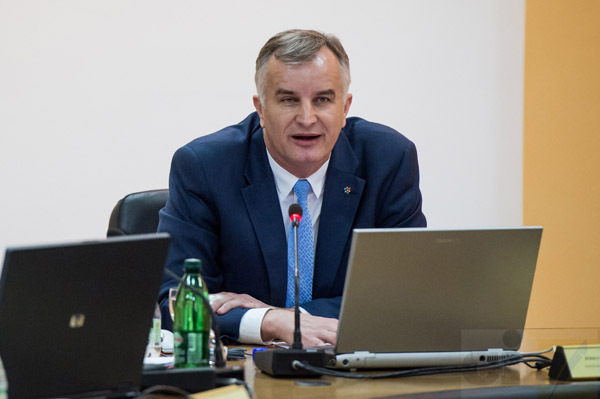 In its 2010 inspection, the Audit Office for the Institutions of the Federation BiH found that these visits were not being done as required by law. As an example, the auditors looked into MI Rakitno which requested nearly 35,000 KM in subsidies for fattening 633 pigs. The ministry’s clerk approved payment. Another visit from the ministry found that these had been imported animals without identification tags and still in the import quarantine. The request was then turned down. Auditors were not informed that an action was taken to punish the clerk who had originally approved the request. As far back in 2009, government auditors listed recommendations for fixing the regulations. Seven years later, the FBiH ministry has not fully realized any. 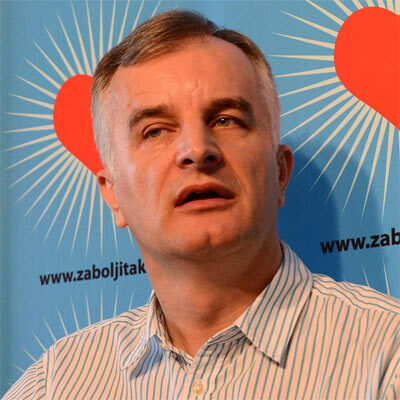 CIN tried for several months to interview FBiH Minister Šemsudin Dedić, but in vain. He told the FBiH Parliament in April 2017 that the government has neglected agriculture. CIN interviewed about 30 vets from across the FBiH. They agreed that the number of cattle and farmers has significantly decreased. Zekerijah Alagić, director of the Veterinary Clinic in Bihać, said that the government has helped decrease the number of cattle.